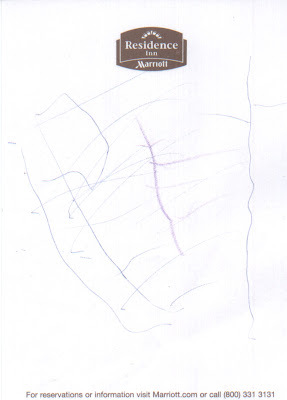 A few months ago, my son (who turned three in January) wrote his name for the first time. As a teacher of writing, I thought it appropriate to give him some comments. Here follow the image and my response. Congratulations on writing your name for the first time! You have done an excellent job learning the three letters necessary for completing this assignment, and you wrote them in sequence with only minimal supervision and guidance from Mama. She and I are both proud of you, and we hope you look back on this as one of the highlights of your three-year-old year. I also have some suggestions you might consider as you continue writing your name in the future—as I would encourage you to do, given this promising beginning. The first point involves spacing. As you know, you ran out of room on this sheet of paper after the first three letters, so you had to make the final “e” next to the initial “p.” It would be better to plan out the spacing of your words in advance to avoid confusing the reader. Also, most readers and editors will expect any capital “e” to have exactly three horizontal lines. Drawing many more horizontal lines on each “e” is fine if you are writing for Mama and me, but when composing for a wider audience, try to stick to three. Along the same lines, you seem at this point to be capitalizing the letters “p” and “e” but not “t”; I would suggest either capitalizing all your letters or only the initial “p,” to make either “PETE” or “Pete.” If you want to know which of those two forms is preferable for a given piece, consult your teacher or editor. Finally, though I certainly understand your desire to reduce your spending on school supplies, especially since you will not even get an allowance for some years yet, I do think you’ll find that readers prefer letterhead or plain white writing paper to hotel stationery. Mama or I can show you where to find such paper at home. Do not let these details overwhelm my main point, Pete: you have done very well with this assignment, and I sincerely look forward to seeing what other words you will write soon. Nice work! I have listened to some of those Teaching Company tapes and have also listened to some of the online college courses, especially a Berkeley course in economics. I enjoy both formats but find them fundamentally different. Aside from the quality of academic content (which is generally strong in both modes), the appeal of The Teaching Company's courses lies in their ability to make the listener feel included in the world of the course. The lecturer speaks directly to the customer who buys the Teaching Company course, carefully contextualizing the materials for an intelligent but nonspecialist audience. The lectures are self-contained; the listener may feel inspired to read some primary materials, but such reading is not expected or required. The Teaching Company sells the feeling of full membership in an excellent lecturer's audience for the price of about a hundred dollars, depending on the course. A university course, however, offers that sense of inclusion only to students who have done preparatory work for each class, and even for online observers who do that work, the experience of the free university courses is fundamentally alienating. The professor addresses the students in the room, takes care of the normal housekeeping that a college class requires, refers to events and people and gestures that are inaccessible to the online observer. I come to these classes having spent all but one year of my adult life in college classrooms, and even I find the format prohibitively unsociable. Such courses provide valuable guidance to exceptionally determined and disciplined students--a goal I support enthusiastically--but for better and for worse, they will not replace the more broadly welcoming format of The Teaching Company.